I am currently a BYU student now and I really do love this university. The teachers, classes, and environment are all one of a kind. I hope to graduate sometime next year. I support Free BYU because I, being a former member of the LDS faith, have changed my religion, following the dictates of my conscience. I grew up a very good Mormon. I would go to seminary, never missed church, and had leadership positions in youth quorums. I always felt a strong connection to the church when I was younger. I never wanted to do anything to disappoint my mom. She made sure that the church played an important role in my life. Because of my closeness to the church I decided to attend BYU. My freshman year was probably the funnest time in my life. One by one, my friends went off on their missions, with everyone being very excited about missionary work. I too, wanted to serve a mission. I knew that it was the ‘right’ thing to do. I didn’t want to disappoint anyone either. Besides, I believed this church to be true with all my heart. So, like my friends, I filled out my mission papers. This mission would really change my life in the best way possible, but not the way I would expect. On my mission I realized that I hated being a missionary and the church left a lot of empty holes that I felt needed to be filled. I felt exactly like a salesman on my mission. The church wasn’t satisfying me both mentally and spiritually. While on my mission, my companion and I went to a mosque. It was the first time in my life I had any encounters with Islam. I felt there the presence of God like I have never felt in my entire history of being Mormon. It was such an amazing feeling. Words can not describe this feeling. Well, such an experience would have it’s implications such as the possibility of the Church not being the fullness of the truth. So I got back from my mission and did research on my own and I found that this new religion was able to fill my soul with more light, and bring me closer to God. I found that Islam explains our purpose more clear and powerful. Converting is definitely the best choice I have made in my life. Unfortunately, BYU thinks otherwise. So I got back to BYU with an enormous challenge of living living two lives. On the outside I am Mormon to everyone, but inside I am a Muslim. It is so hard to live like this. I fear getting close to people for fear of them finding out. I try to isolate myself from my ward for fear that they will see me practice my religion. 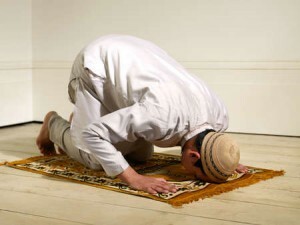 Islam requires that I do a ritual prayer five times a day. These prayers involve the whole body and anyone seeing me pray could instantly spot me as a muslim. Every time I pray, I am afraid that someone will see me or confront me. I have a hard time reading religious texts in my apartment and praying is pretty much impossible. I can’t talk about this to anyone and the worst part, I am forced to lie about this. On top of this all I have mental health problems that come up with stress. I have been having panic attacks because of all of this stress. Despite all of this, I gain a great amount of strength from my religion which helps me overcome all of this. All I did was change my beliefs about God. There is nothing inherently wrong with this. I am not at all trying to destroy the church. I don’t hate the church, I am not the church’s enemy. I just believe that there is more light out there than the church as to offer. This should be no grounds of kicking me out of BYU. This is a very hypocritical policy. Putting a pause on studying and switching schools would be a very hard thing for me, especially when I am so close to graduation.